On the site of a former warehouse, is to provide new student accommodation for Edinburgh Napier University and will create 234 student rooms over three blocks. 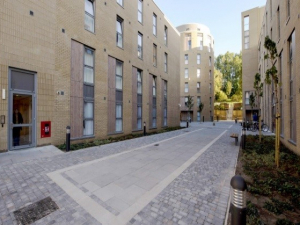 The modern student rooms will include landscaped communal space and have good access to public transport with Haymarket station a short walk away as well as the provision of cycle storage. The development will also have a link to Dalry Park. The scheme will achieve a BREEAM Very Good rating assisted by a Combined Heat and Power plant.